Benjamin Cottam, in his first New York solo show, inverted the common art-crit assumption that all art has some essential relationship to death and/or nostalgia. In contrast to classical portraiture, rather than capture moments or images in time, Cottam’s paintings—at first glance black monoliths—sever presumed sentimentality. Cottam’s oils gain more from the future than the past; it is by studied looking that the forms of Cottam’s works take shape. Only gradually are foregrounds, on the cusp of perception, realized/invented by the viewer. While Cottam’s glazes seem significant of a scrim representing the dark end that awaits us, they are in fact barriers to the temptation of assumption, and ultimately, death itself. In Cottam’s second New York show, a group of ten portraits span Cottam’s contemporaries: friends, supporters, other artists. The current moment is largely defined by a movement to put forth the creative person first, to ignore the work and its content; it is a ramification of a society resigned to the death of creative culture. But where many artists dwell on the apparencies of persona—the fashionista clothing, the mock urbanity—Cottam has stripped his figures of any facile cues. Cottam divests his subjects (including himself, in a self-portrait) of the expectation that persona/identity functions to cast us in life roles as tired as the characters of the latest Broadway Revival. 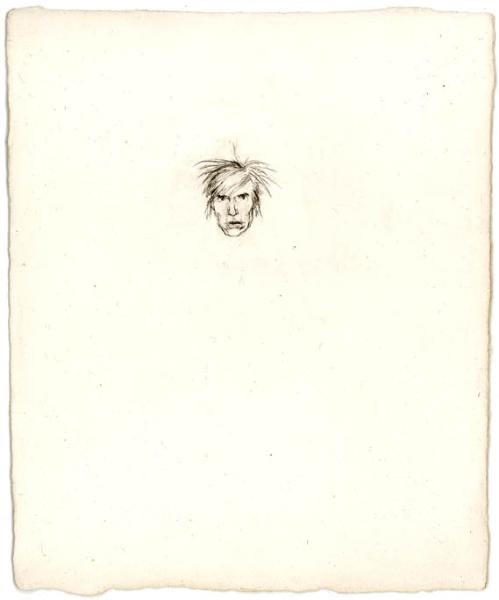 A series of 18 drawings, silverpoint on paper, sketch the inebriated states of Pete Doherty (The Libertines, Babyshambles) during the course of his public-eye melt down. The dime-size images shrink the person—absent media/pop grandeur—to a mere smudge of life. These postage-stamp scaled images suggest not only what it means to be reduced to symbol, but how the individual, in the present attitude of what art is, becomes reduced to commodity. Even Rock ‘N Roll, with its age-old cycles (such as Doherty’s punk revival, revival), has become a shadowy ghost of itself. Our fascination with figures such as Doherty implicates us in the larger cultural zombification, which is fundamental to Cottam’s commission: not only the horror, but the allure of spiritual death.